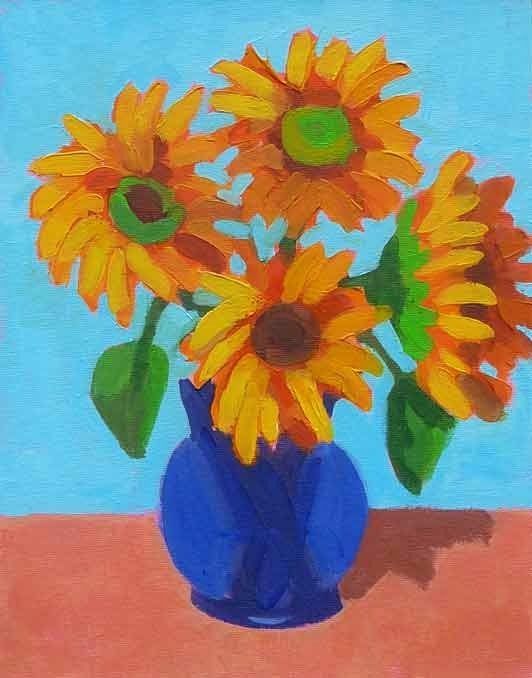 In conjunction with our show opening Saturday at Yarmouth Frame and Gallery, which includes three large sunflower paintings, we're doing a Paint Night at the Gallery. 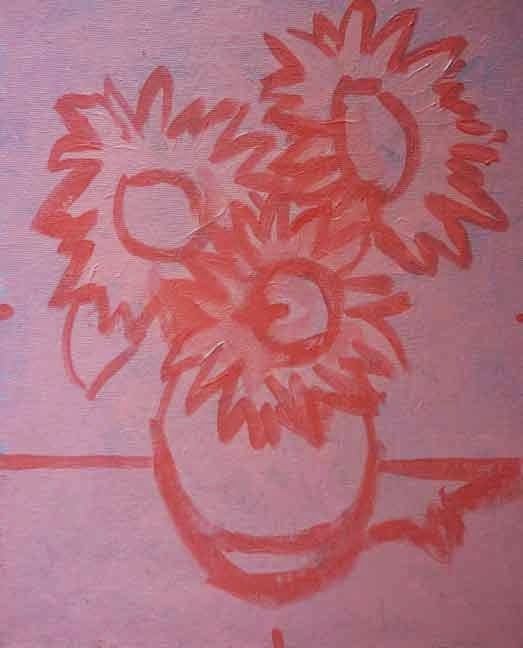 I'm teaching it, so I've been practicing sunflowers in acrylic, and trying to come up with a composition that anyone can manage, while sipping their wine. The top image is my first try (not counting the one where I used a hog brush - such a bad idea with acrylic!). The gallerista and I though this might be too complicated. So Try 2 is a simplified version. 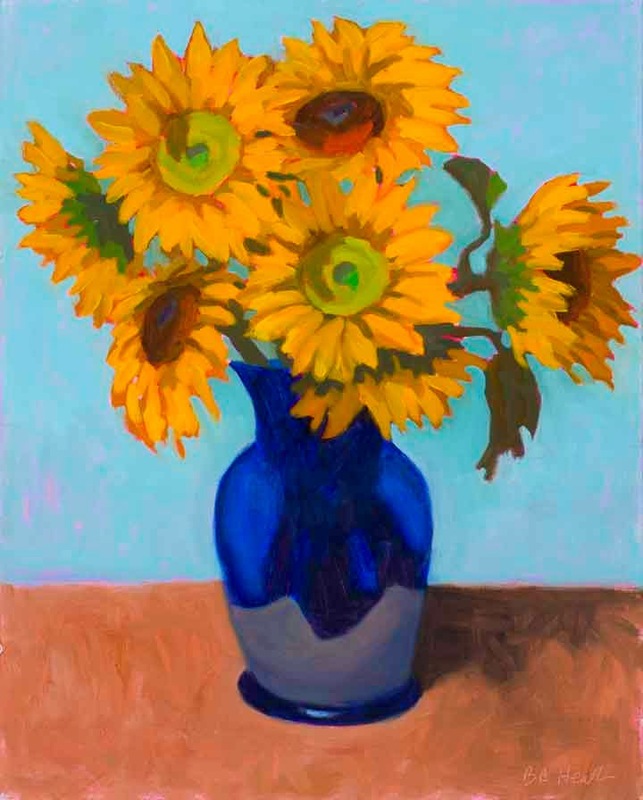 Both are much simplified over my 20"x16" Sunflower oil painting in the show. The bottom image shows the drawing for Try 2, where marks are made to indicate the middle of each side, the top and bottom, and also the center. That's part of the approach I'll use to teach the drawing. I'd like to send a big thank you to JanettMarie, who gave me some good advice on how much to simplify the painting. If you'd like to participate in Paint Night at the Gallery, please call the gallery at 207-846-7777 to register. I'd love to have you join us! Above are a couple more paintings from the Castine Plein Air Festival. These will be included in the Yarmouth Frame and Gallery show "Dipping the Brush", which opens on Saturday, August 2. I'll be at the opening from 4-7, and would love to see you there. To see all my paintings in the show, click here. Today I had a nice visit from Fay Terry, a follower of my blog from North Carolina. 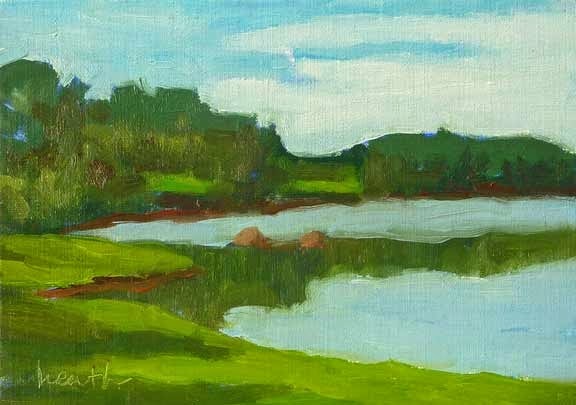 We had such fun having lunch and painting at one of my favorite Maine marshes. Thanks, Fay, it was fun! 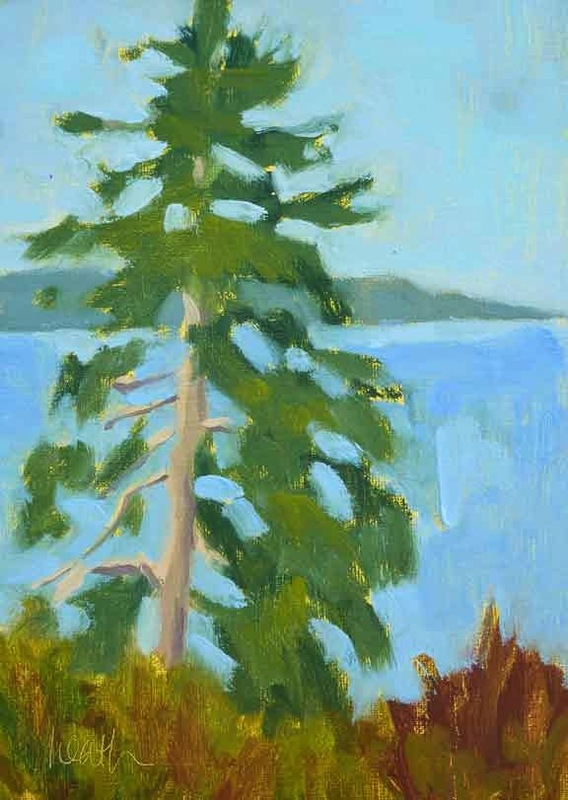 I returned this morning from the Castine Plein Air Festival, which was a great success. Forty artists participated, and most of them sold paintings. I sold four of the nine that I painted, and am thrilled. I neglected to take a photo of one of the sold paintings, a sunset from Wadsworth Cove. It was dark when I finished it, and I was painting by feel. I was surprised at how well it turned out when I got a look the next morning! I especially enjoy meeting other artists at these events, particularly those whose work I know. I'd never met Phil Frey before, though I'd admired his work for years, and enjoyed painting with him. And I was so pleased when he won first prize. A little plein air piece done on Maquoit Bay. If you're wondering how I get Raymar panels in these wide formats, it's simple - they can be cut with a table saw. It can be a little unnerving when the painting is already painted. 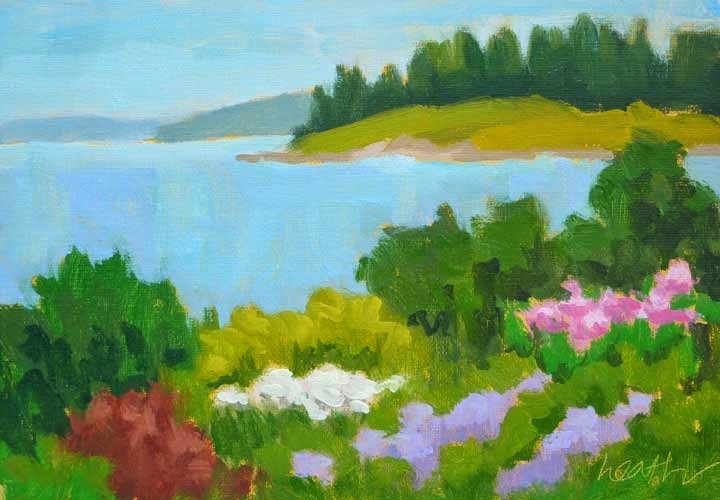 I'm off today to the Castine Plein Air Festival, which I thoroughly enjoyed last year. It runs tomorrow morning through Saturday evening, with the show and sale at the Alfond Student Union, Maine Maritime Academy, on Pleasant Street, 6-8PM on Saturday. Last year the event was packed, so be there at 6 if you want your choice of paintings! 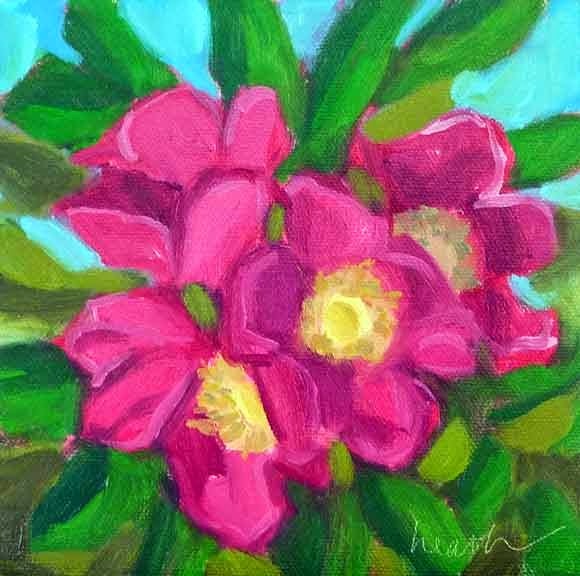 Please visit my newly designed website, at www.bobbiheath.com, where you can sign up for my newsletter and learn about each month's events in advance. Some nice women who attended the Ocean Park "Meet the Artists" event, expressed interest in flowers. I found these near the beach on Porter Road. I'd like to paint more of them, it's quite a challenge! 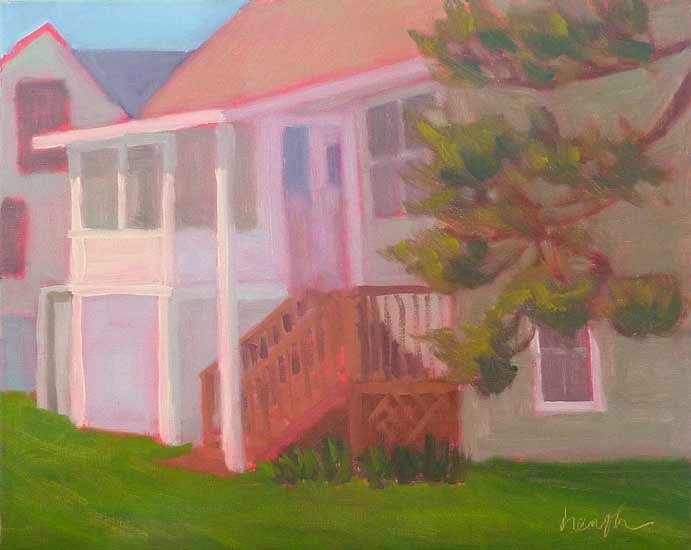 The painting above won 3rd prize at the Ocean Park Plein Air Festival. I'm thrilled! And below is a piece I was asked to paint, which turned out to be a fun exercise in painting white. That reminded me of fellow painter Mary Sheehan Winn, who is a master white painter. It's a challenge, but I was very pleased with the effort. The Ocean Plein Air Festival is in full swing, and we are all having a great time. Everyone is so friendly, and interested in learning about what catches an artist's eye. And very kind. I've been offered cold drinks and the use of a bathroom, both were much appreciated! We are at the middle of the second day and I've done four paintings. Above, #1, was done yesterday morning at the platform on the Ted Wells trail, so a bit of a hike from the car. It was hot, but the scene was lovely, and so Ellen Pelletier and I persevered. The second painting shown was the third painted, we had a wonderful sunset to work with! I'll post the rest over the next few days. 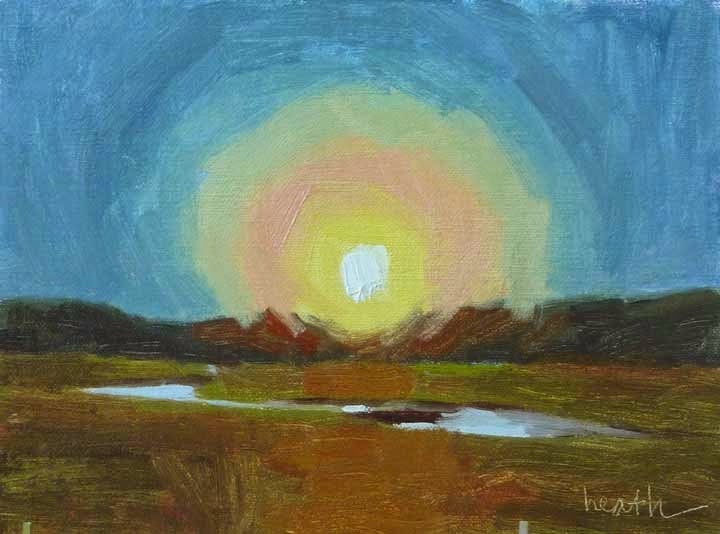 "Ebb Tide in the Marsh"
It's Plein Air Festival time! This afternoon was the beginning of the Ocean Park Plein Air Festival, which I'll be participating in through Friday. There are 9 artists, and today we got a tour of the village and met some of the residents. Ocean Park is a quintessential seaside town to the south of Old Orchard Beach, with beautiful cottages, a sandy beach, a marsh, and a few shops downtown. I'm told there's an old fashioned soda fountain, which I will definitely check out. The exhibit and sale is from 5-7 on Friday, at the Temple, 50 Temple Ave, Ocean Park, ME. I'd love to see you there. 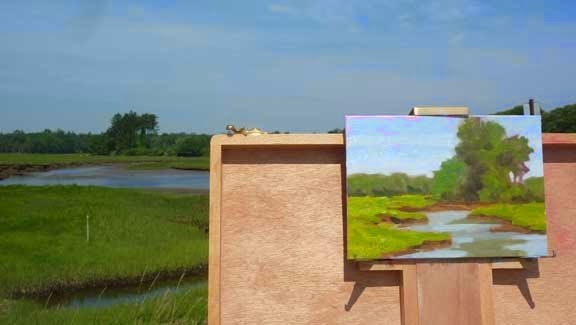 I did the painting above yesterday morning in Kennebunk, once again in the Rachel Carson preserve. It's a lot more crowded in July than it was in May! 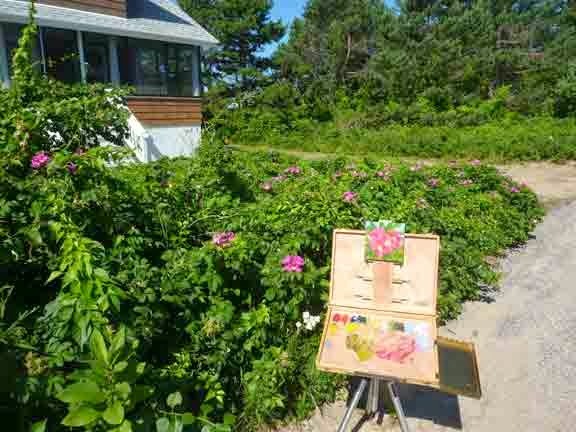 It's fishing and beach time as well as plein air time in Maine. I'm so thrilled it's July. I've finished my latest technology consulting engagement and have four months to paint! There are lots of events coming up as well, the first is happening next week. You can learn all about those on my new website. And I've just sent out my first newsletter, and will be happy to forward it to you, if you'll email me or leave a comment on this post. 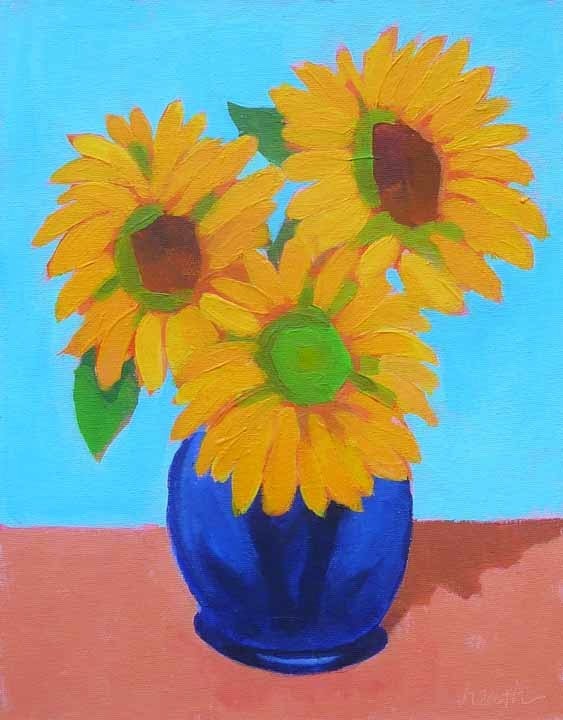 I worked on this painting over the last two days, and was fortunate to be able to have the vase outside in the sunshine, while I stood in the shade of the house. I'm really pleased with it, though it still needs highlights and maybe a little tweaking. I plan to include it the show opening August 2nd at Yarmouth Frame and Gallery.